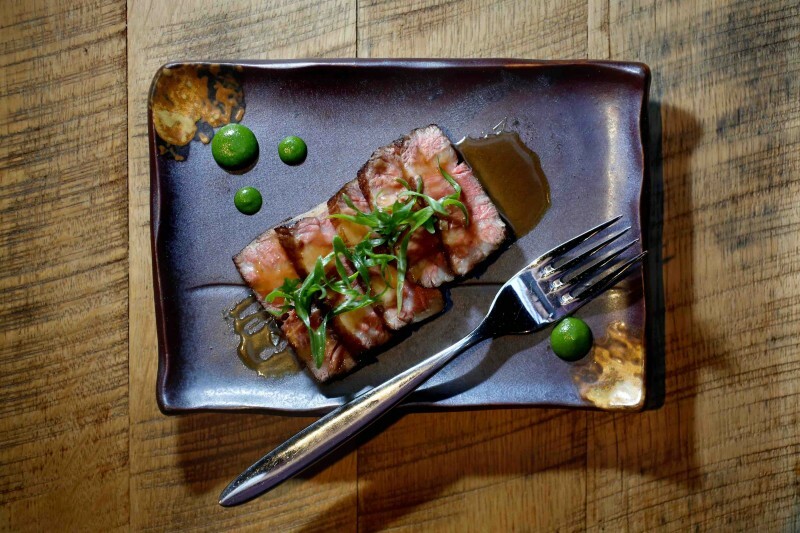 For Wine Country dining, it’s the year of yakitori and designer ice cream. Call it coincidence, but four of our most significant new restaurants for 2016 boast a Japanese theme, with three of those four offering the skewered meats plus the dessert that’s immensely popular in Japan. That’s all great for me, since I love Japanese cuisine and could eat it every day. Yet even less addicted fans have good reason to visit all the new places. Each chef takes a different approach to the Asian cooking style, with varying techniques and ingredient twists. So far, Two Birds is the most inventive of them all. 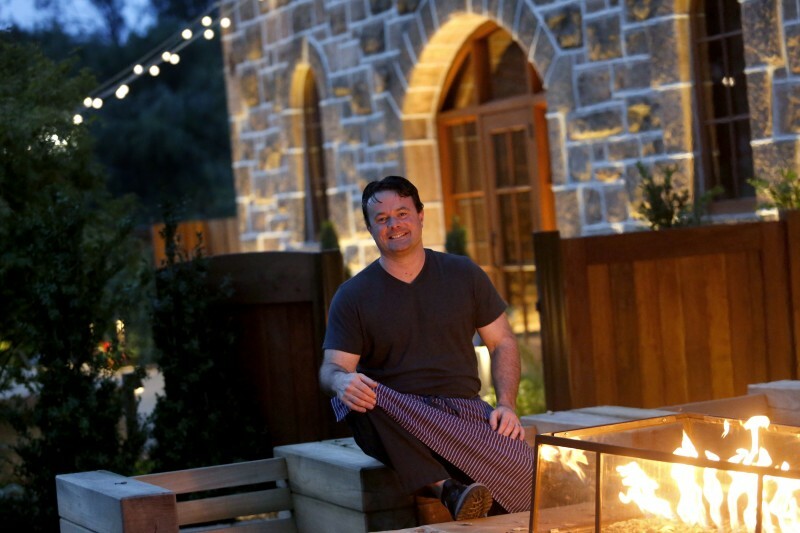 Credit its talent, chef Douglas Keane of Healdsburg’s former two-Michelin-star Cyrus and his partner Sang Yoon, of the acclaimed Father’s Office American gastropub and Lukshon Asian Fusion in Los Angeles. Yes, you can get charcoal- and wood-grilled teriyaki chicken thigh here, served in sweet shiitake sauce ($12). But surely no Tokyo restaurant offers chips ‘n’ dip of fried wontons dusted in liquid nitrogen-frozen togarashi spice, dunked in Kewpie mayonnaise ($6), or deviled eggs kicked up with wasabi, sprinkled in red chile shichimi togarashi and scattered in gribenes (chicken skin cracklings). In short, leave your assumptions at the door. The idea is to appreciate inventive recipes reflecting fine dining, California seasonality and just an undercurrent of Japanese tradition. 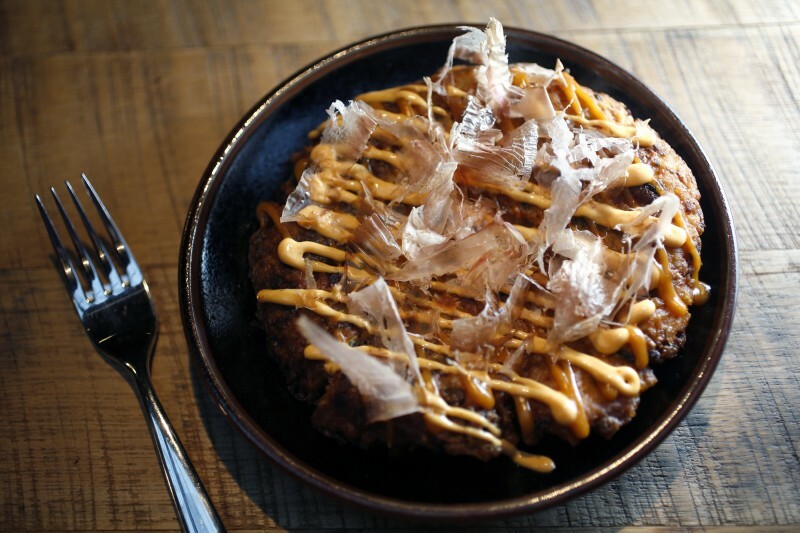 The menu lists one dish as a “savory Japanese pancake,” for example, instead of classic okonomiyaki ($16). That’s because okonomiyaki usually is a rather thin, crisp edged but moist, golden, egg-flour pancake laced with shredded cabbage, any of a wide variety of meats or seafood, and a finishing drizzle of mayonnaise and tangy Worcestershire-like sauce. The savoy Japanese pancake with green onion, sambal mayo and topped with bonito flakes at Two Birds One Stone in St. Helena. This version makes me think of brioche — the rust-brown pie is thick with crunchy edges and a custardy interior, dotted with lots of green onion and ginger and capped in thick squiggles of sambal mayo plus a caramel-like spicy sauce. Bonito flakes dance across the top as the heat dissolves the whisper-thin fish leaves, and it’s so remarkably flavorful in its black pottery dish that I don’t miss the salty duck ham that was included in another visit. Radishes and butter are a popular Wine Country snack, and these chefs compress the crunchy vegetables with dashi for a swipe through roasted nori goat milk butter ($7); it’s a terrific flavor marriage. 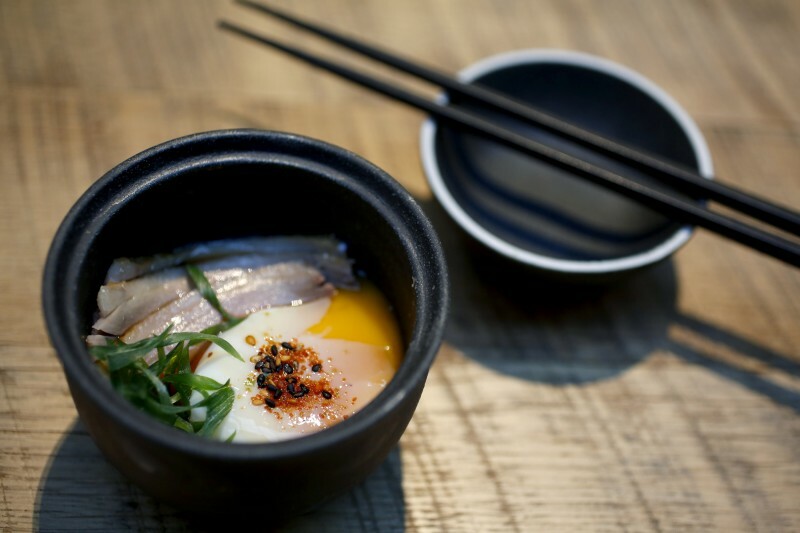 A spin on chawanmushi is sumptuous, as well, presented as “ham & eggs” of warm, savory custard layered with highly smoked duck ham, scallion greens, togarashi and silky, poached-in-shell onsen jidori egg ($16). Head-on prawns are difficult to eat, though, with little meaty reward for dismantling the sudachi-salted, charred lime-spritzed shell. Our server explained that the crustaceans were slit down the back for easy enjoyment, but ours weren’t. hef Douglas Keane at Two Birds One Stone in St. Helena. When ordering, keep in mind that while Asian dining often showcases lighter, cleaner flavors, here, the chefs lean toward rich, opulent dishes. Portions are ample enough for sharing, and with such full-bodied recipes, it’s best to focus on just a plate or two at a time and see how your appetite keeps up. Six small slabs of Wagyu short rib ($22) look rather plain on the plate with nothing other than dollops of pea puree and a coat of thin, mild Korean barbecue sauce. But generous fat marbling and a soft, sous vide texture makes a very lavish dish. With a side of lotus root kimchee ($6) to spark your palate or chilled sesame noodles brightened with pickled beech mushrooms and cucumber ($14), it’s a full meal. 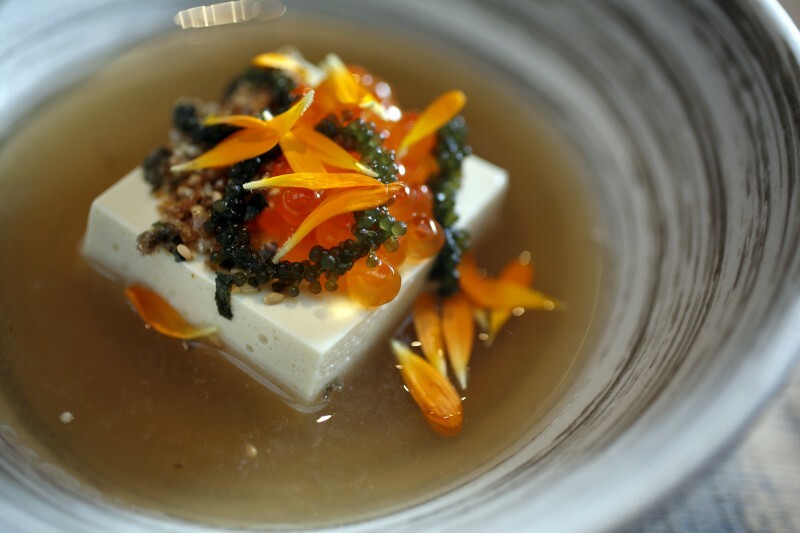 On the more delicate side, the kitchen sends out beautiful silken tofu, awash in chilled shiitake broth and dressed in furikake seasoning, salmon roe and two thin tendrils of tiny, succulent sea grapes ($11). 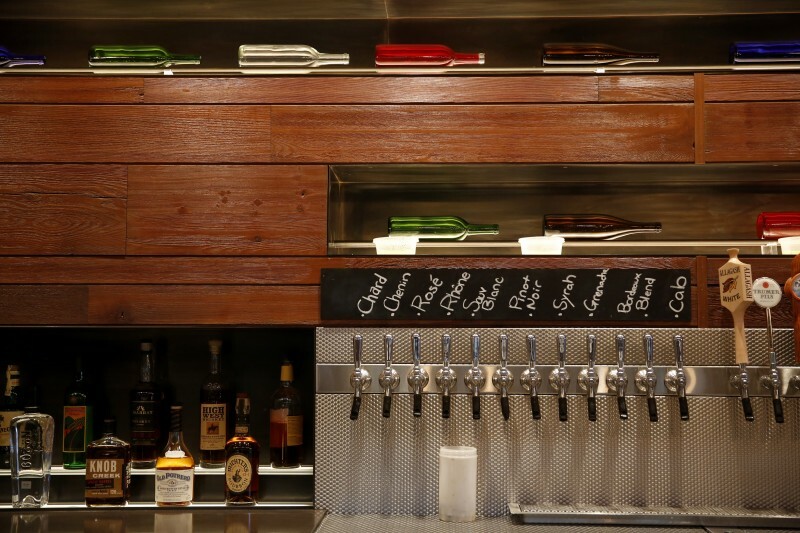 A variety of wines on tap at Two Birds One Stone in St. Helena. I also like the chicken meatballs, simple and satisfying in hoisin glaze. The little nibbles feel glamorous, enjoyed in the drop-dead beautiful setting within the newly renovated 130-year-old Freemark Abbey Winery. 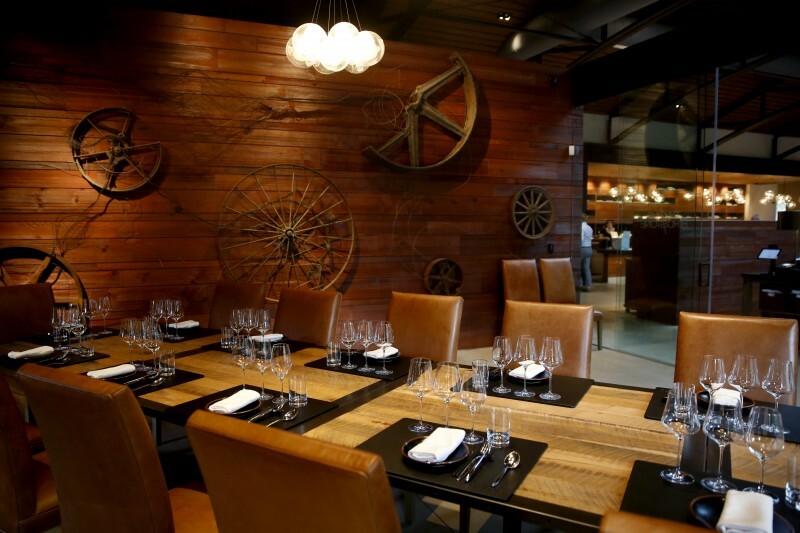 Spanning 4,000 square feet, the 80-seat dining room is open and airy, while the 35 patio seats offer pretty views. No stereotypical Japanese look for this interior, but rock walls, a concrete floor, a backlit entry wall of wine, tufted couch booths and well-spaced wood tables for a feel as modern as the food. To sip, Keane and Yoon put a stamp on wine and cocktails fitting the fancy space. Ten wines are on tap for 5-, 13- or 26-ounce pours, and they’re made exclusively for the restaurant by notable local winemakers such as Steve Matthiasson (a lovely 2015 Grenache, Syrah, Mourvedre Rosé, $10, $25, $49). Beyond the impressive stable of American and Japanese whiskeys, the bar crafts signature drinks like a potent gimlet, made hot-and-sour with Monopolowa vodka, Thai chile, lime, Thai basil and shiso ($12). And while the food bill admittedly can quickly get pricey, in a very friendly touch, corkage is complimentary for one bottle of Sonoma or Napa wine per guest (not table). The creative journey continues at dessert, where alongside the green tea soft serve ice cream sprinkled in ginger ($7), we can savor a bunch of quite sweet peony grapes, dressed in pickled ginger with shards of shattered white miso custard ($7). It’s unusual, and perhaps a bit too unusual, I decided, with so many flavors and textures. It remains to be seen if everyday diners will embrace the more eclectic dishes. On one visit, I asked my server, a cheerful young lady, what her favorite dishes were. “Fried chicken,” she said immediately. It turns out that on Sundays, the kitchen adds a special supper, serving a whole, local bird that’s been kimchee-brined, battered and fried crispy golden, then tossed with sweet-spicy Korean barbecue glaze ($65). Served with pickled lemon cucumbers, kimchee and compressed spiced watermelon, it’s different, but delectable. Carey Sweet is a Santa Rosa-based food and restaurant writer. 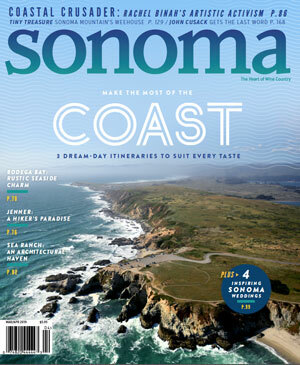 Read her restaurant reviews every other week in Sonoma Life. Contact her at carey@careysweet.com.